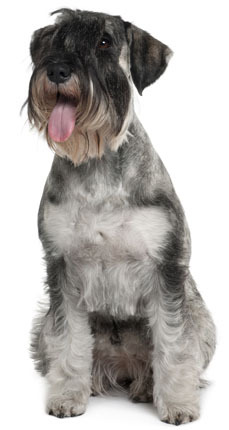 Learn about the temperament and personality of the Standard Schnauzer. Discover what he's like to live with, his traits and characteristics and how he generally behaves. And look at lots of Standard Schnauzer photos. The Standard Schnauzer is an outstanding companion, known for his devotion and love for family. He is also incredibly active. His boisterous spirit and keen intelligence can make him quite a handful. Obedience training is important with this breed. They are athletic, agile, and needs lots and lots of exercise. Obedience, agility, rally, tracking, and herding can help to satisfy this need. If you don't train your Schnauzer, it will be difficult to give him all the exercise he needs, because he will drag you all over town on the end of a leash. While they can be stubborn and manipulative, they take very well to consistent training. Schnauzers can fit into almost any lifestyle as long as they get lots of exercise and activity, and as long as they get to be part of the family. These are people-dogs who thrive on love, attention, and close interaction with their people. They love children, are protective of them, but can be a bit boisterous for babies and toddlers. Play needs to be supervised, as sometimes Schnauzers nip when they are playing. They make excellent watchdogs and will alert the family to any potential danger with a deep bark. They are naturally protective of the family they adore and they are fearless. The Standard Schnauzer will chase squirrels and cats and other small furry things. He might also harass the family cat. This breed does best with a fenced in yard, but bear in mind, a Standard Schnauzer can jump a 6' fence. These dogs act like puppies until they are 2-3 years old and they can be mischievous and dominant. But they are also affectionate and loyal. They are sometimes called "the dog with the human brain." The Standard Schnauzer is very intelligent and easy to train. He learns new commands very fast. The Standard Schnauzer sheds practically no hair at all. You'll virtually never find a hair in your home!